Look familiar? If you’re Greek, had the pleasure of being invited to Greek Easter by friends or eaten at a good taverna, these side-by-side spits of lamb and kokoretsi are staples. What is kokoretsi? Don’t ask and just try it. Seriously. I also recommend sampling it more than once because everyone prepares it differently. Though I and many Greeks in my life do not like lamb that much, there’s something nice about the men taking turns at the spit and getting drunk over conversation, while children play and women gossip busy themselves in the kitchen. Nowadays, however, nearly everyone has an electric device, people pick at food all day and serving the lamb is somewhat anti-climatic. Krima. It shan’t be long now! Some know about Mr. Panos from Lazopoulos. Since I don’t watch Greek TV for reasons explained in “More windows on Greek TV than my house,” my introduction came through Big C.
This is his Greek Easter “vlog.” To me, the funniest part is his imitation of the way Americans pronounce Greek words, and I’m not ashamed to admit I sounded like that 13 years ago. Hey, we all have to start somewhere. *Warning: Only those with a sense a humor should watch the video. Also, should you ever play τσούγκρισμα with the Archbishop, let him win or be quick to apologize and give him your winning egg if you crack his. I speak from first-hand experience. Kokoretsi is Great – I wish it was commonly available in the UK. And those windows on Greek TV crack me up. Half the time people in those windows are just warm props – they don’t even ever say anything. I’d love to see a donkey and a goat in one of those windows. Just for the comedy value. Glad to see Mr. Panos make it across the Atlantic…Yanni is a hilarious Greek-American comic. Have a wonderful Easter…got mine lamb and offal all set up! A Greek friend of mine called kokoretsi “the king of mezes.” It seems progressively harder to find in Greece. I like it myself, though I suppose I should be afraid of mad lamb disease. When I first visited Greece years ago many psistaries still offered kephalaki, but I haven’t seen them in a long time. That, of course, is too authentic probably even for some Greeks today. It helps if you brace yourself first with a couple of ouzos. The famous Athens restaurant Costayiannis used to have (I haven’t been there for ages so I don’t know if they still do) a dish of a sort of stewed kokoretsi, which on the English language menu was rather unfortunately called “bowels Roumeli.” I may have been the only foreigner who ever ordered it. I’m just enjoying the calm before the storm! Have a great day! Very funny clip. Wish I could partake of the lambs – our Franco-German Easter was a less relaxing mixture of a burning bus, a concentration camp and a killing mountain bike ride. All of which made me remember how much we enjoyed our Greek Easter last year brought to us in England by our friends. Hope you have a great day. The reason you don’t see kefalaki much any more is that it’s been made illegal due to the whole mad cow disease thing. That’s mostly adhered to in Greece. There are people saying that kokoretsi too has been outlawed (by the european union), but apparently nobody really cares about that rule… maybe it’s the reason for seeing a bit less of it though? Hristos Anesti, Kat! Church all week, ate all day, tired to say the least! 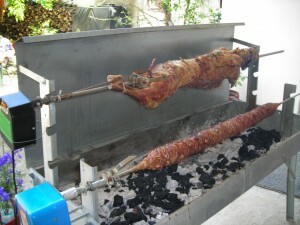 Skipped the kokoretsi this year, but the lamb roasted in the oven was mouth wateringly good. Unfortunately, I have tried kokoretsi and did not find it palatable. Then again, I have the taste buds of a 5 year old. Thanos won’t eat it either, although he happily told me I should try it. A – Maybe we could send you some 😉 And yes, I know what you mean, sometimes people in those windows look like they’re frozen in time…except they occasionally blink. P – Excellent! You always cook up a storm no matter where you are. B – Come hang out with us. There’s no shortage of it where we go. And yes, some things are best not translated. R – Happy Easter, R. Thinking of you and S.
ED – So true. Right after I read your message, we left the house to enter the “xamos,” and it didn’t end for us until early evening. Why? Well, his parents are divorced so we get to do it twice. It’s one of two days of the year that I prepare with travel medication, caffeine and alcohol. The other is, “The thing.” How did you fare? M – Nice to see you again! Wow, there was a killing mountain bike ride over here too (literally), but no bus or concentration camp. Come over to GR. MV – Alithos anesti! I think all of us Anglo speakers start off on the wrong foot, unless we’ve had experience with a similar language. Hopefully, some of us progress beyond what’s presented in the video, which is a comical sketch. As we discussed in “Why don’t you speak Greek fluently?” the “wall” for Greek is at the beginning, not in the middle like English. But if you’re of some Greek origin, you may not appreciate the gift of having exposure to the language in any form or length, while the rest of us struggle. BB – Hi! Thanks for adding that information. You’re right, and it’s probably more common to see less of it in more popular areas where there may be checks or finger pointing. For example, in the center, there’s definitely less of it compared to 10 years ago. But if I go to Nea Erythrea or even Byrona, I can find it with no problem. D – Hi Dora, alithos anesti! I was thinking about how your celebration went. The oven is a perfectly good way to cook lamb. We had one lamb from the spit, and another from the oven. I survived the Easter thing… to say it was “stressful” would be an understatement but overall it was good. I had the lamb and the kokoretsi, I like the crunchy outside of it… the middle not so much. We were having the conversation about it being banned by the EU but my cousin seems to think it was banned because it was high in calories. I doubt that’s the reason. Happy Easter Kat! The video cracks me up. I love his outfit the most! LOL! We roasted a whole lamb, but not any kokoretsi since our gathering was limited to my husband’s immediate family …all 2 of them. But, we had some friends show up at the last minute and we had a great time. Anyway, I’ve tried it before and it’s not my thing. I’ve even tried the magaritsa once, to be polite. I didn’t like that at all. MIL ate the eyeballs in front of me and I almost lost my meal…she just digs in. Man. Ugh. Nothing subtle about poking a fork in the eye and digging it out. Bleck. Kokoretsi banned in Greece? Well, according to the sage that is my Greek Mother-in-law, apparently those same Europeans who ban Kokoretsi are the same Europeans who sneak off to Greece every year to eat it (illegally) on their vacations. Unfortunately SNOPES has no remedy for me to check out many of my Greek mother-in-law’s urban legends as well as many other urban legends heard by our Greek hosts…. Too bad we couldn’t find someone to create a Snopes type site to debunk some of the silly stuff we hear in Greece. The Scorpion, I doubt that EU bureaucrats would dig something like kokoretsi, they’re probably too grey and featureless. As for the validity on the story of the ban on these things, this CNN article from 1997 was something like hit 3 on my first google search: http://edition.cnn.com/WORLD/9709/28/greece.edible.eyes/ – no idea if you can qualify CNN as a reliable source for anything Greek. I understood that the ban only applies to slaughterhouses – ie meat processing facilities from which meat is going to further public distribution. So if you get your easter lamb from a farmer and do the dirty work yourself, you can still have your treats. Hi Betabug, I read your CNN link. And remarkably I couldn’t help but notice this quote from a Greek housewife and wondered if my Mother-in-law was interviewed (probably not since she doesn’t speak English”. ED – LOL! I hear you. After a week of detoxification and mild fasting to rid of Pascha poundage, I feel somewhat normal. The S & BB – I don’t think GR in general is known for adhering to EU laws. 😉 Personally, I don’t consider CNN’s coverage of Greece to be to standard. But the link is appreciated — readers have used it. A – There are rows of tavernas where I live, and each one has kokoretsi (two spits) every single day. So I think implementation is lax because I doubt all these lambs come from small-time farmers.